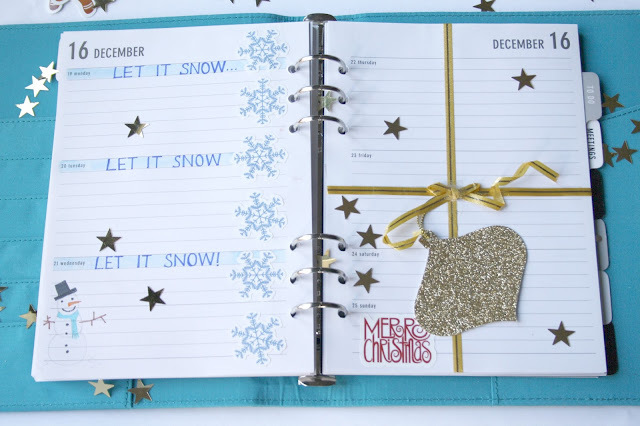 With Christmas edging ever closer, I decided that now was the perfect time to get into the festive spirit by transforming my journal into a winter wonderland! If you read my Stationery Haul post back in October, you'll have seen my gorgeous Paperchase organiser that I got on sale! 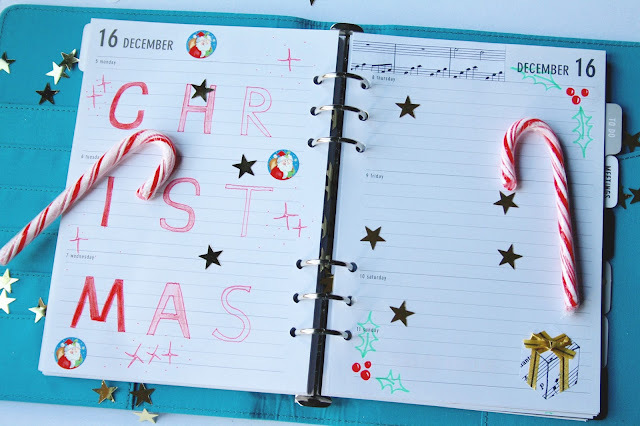 I had just as much fun decorating this journal as I do when putting up the Christmas decorations in my house, and you can do this too - using just a few simple supplies that you'll already have knocking around your house in the festive period. 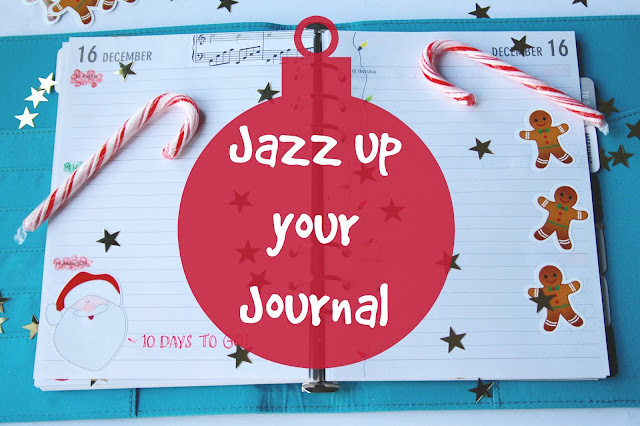 So, grab a seat by the fire, brew yourself some eggnog or mulled wine, and let me show you how to jazz up your journal for Christmas! I kicked off my journal by adding some Christmas lettering to the pages! I just outlined the letters in red felt-tip, and coloured them in with a gradient effect using a colouring pencil. You can make this lettering say anything you want! I also stuck on some cute Santa stickers. On the next page, my pens and pencils were in action again, drawing on some holly at the corners. Simple designs like this are really effective and don't make your page look over-crowded. Next, I used some music note gift wrap to create the border at the top, and I cut out a cube shape using the same wrap, then stuck on some gold ribbon to make it look like a present! 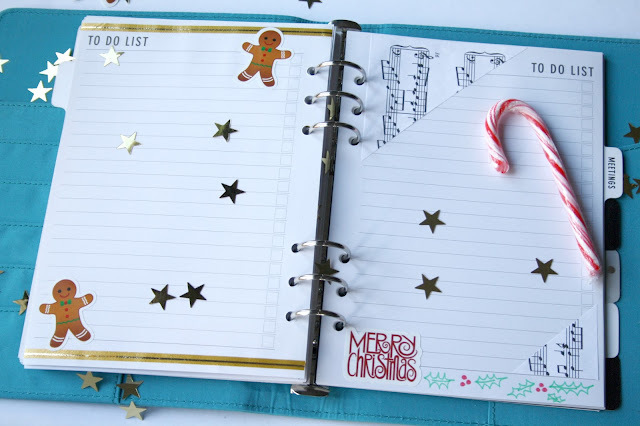 The easiest way to immediately bring some Christmas cheer to your journal is by adding a few stickers! I designed my own customised stickers using the StickerApp* website. On the StickerApp site, you simply upload the image of what you'd like to appear on your sticker, and select the size, and how many stickers you'd like. You can even choose to have your stickers die-cut, which I think looks super effective! All of the prints are really high quality, and I was very impressed with them. If you don't want to design your own stickers, you can also choose from their own pre-made designs. The Santa and the gingerbread men stickers on the pages above are all from StickerApp! 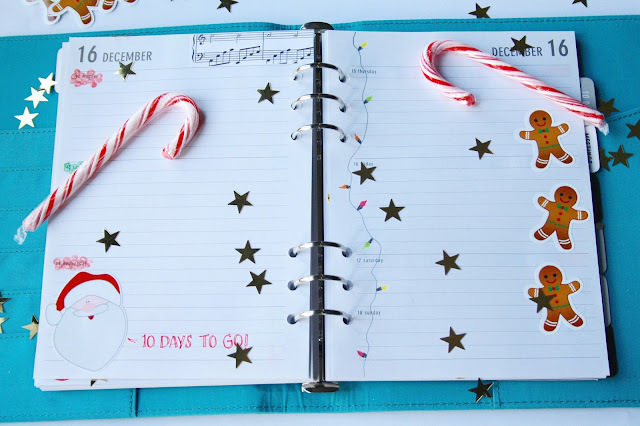 To complement them, I added more music note gift wrap, some colourful bubbles over the dates, and a line of fairy lights down the side of the page, just using a biro and felt tips! These have to be the pages that I'm proudest of! For the snow themed page, I drew my own little snowman in the corner, and stuck on some snowflake stickers from StickerApp at the side. The "Let It Snow" text was written in felt pen, and I shaded in the background in pencil. On the other side, I wrapped up my last page like a present! I measured my page, cut the appropriate lengths from gold ribbon, stuck on a bow in the center, and added a gift tag. I marked on the big day itself using a "Merry Christmas" sticker, again from StickerApp. My journal also features special to do list pages, and I couldn't resist jazzing these up as well! Again, I cut lengths of gold ribbon for the borders on the left page, and added some more adorable gingerbread men. For the right hand page, I cut triangles from the music note gift wrap for the borders, and added more stickers and little doodles of holly. I just love adding extra little details to my journal! I turned the gift tag that I attached above into a mini to-do list, for me to write on my last minute tasks in the days running up to Christmas. 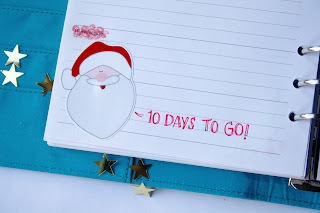 I also gave my little Santa sticker a speech bubble, counting down the days! Small details like this really bring the whole journal to life! 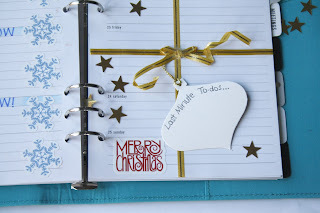 I hope you've enjoyed seeing how I've created my Christmas journal! If you do the same, please tweet me a photo as I'd love to see it! Don't forget to check out the StickerApp website and make it the first stop for all your Christmas stickers! * Sponsored link. I was sent the above products from StickerApp for free to review, but all opinions are my own.